You may be gaining weight rapidly at this point, even if you're not eating much. Experts say that the amount of weight you put on during pregnancy is dictated primarily by your genes, so don't necessarily blame yourself if the weight's accumulating faster than you'd like. Your baby's movements are felt as a gentle, fluttering sensation at first, but get stronger and more obvious as time passes. 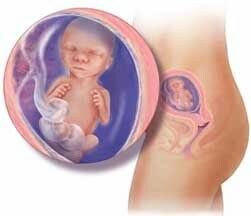 Some babies kick vigorously and often, others are quieter. And many seem most active at night!